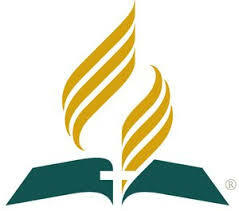 The choice of the Church's logo reflects the core values that Seventh-day Adventists are committed to. The foundation is the Bible, the Word of God, shown open since its message must necessarily be read and put into practice. Central to that Biblical message is the Cross, and is also central in the logo. Above the Cross and the open Bible is the burning flame of the Holy Spirit, the messenger of Truth.